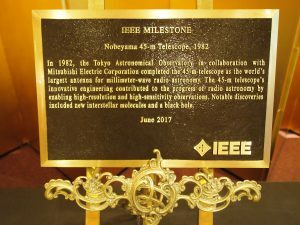 Dedication ceremony of IEEE Milestone for “Nobeyama 45-m Telescope” was held at Josui Kaikan Tokyo on June 14, 2017. Mr. James A. Jefferies, IEEE President-Elect, presented a commemorative plaque to Dr. Masahiko Hayashi, Director General of National Astronomical Observatory of Japan, NAO, and Mr. Masaki Sakuyama, President & CEO of Mitsubishi Electric Corporation. 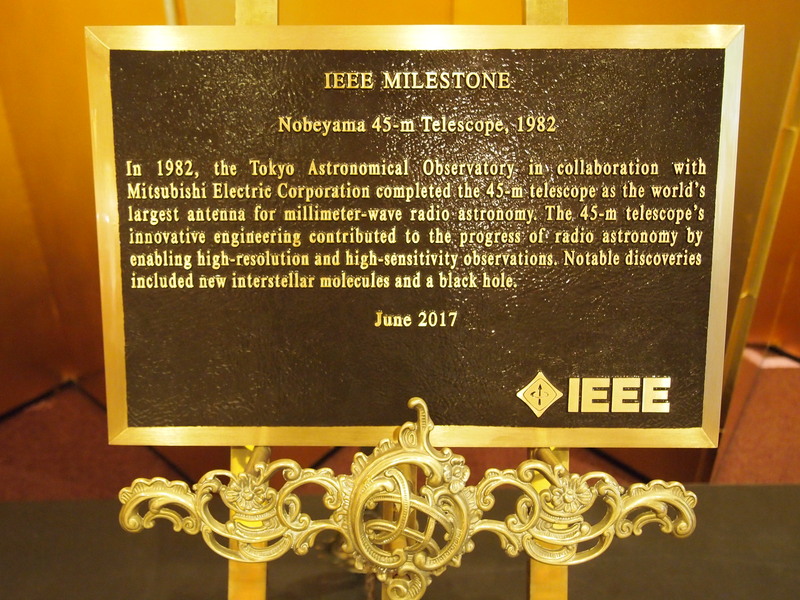 The approved IEEE Milestone is as follows. 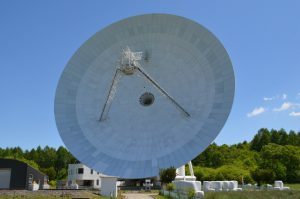 In 1982, the Tokyo Astronomical Observatory in collaboration with Mitsubishi Electric Corporation completed the 45-m telescope as the world’s largest antenna for millimeter-wave radio astronomy. The 45-m telescope’s innovative engineering contributed to the progress of radio astronomy by enabling high-resolution and high-sensitivity observations. Notable discoveries included new interstellar molecules and a black hole. 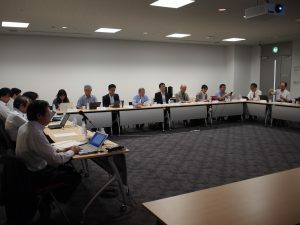 After the dedication ceremony and commemorative reception, IEEE milestone commemorative lectures hosted by IEEE Tokyo Section were held with about 98 participants. Three lectures of the following have been held. 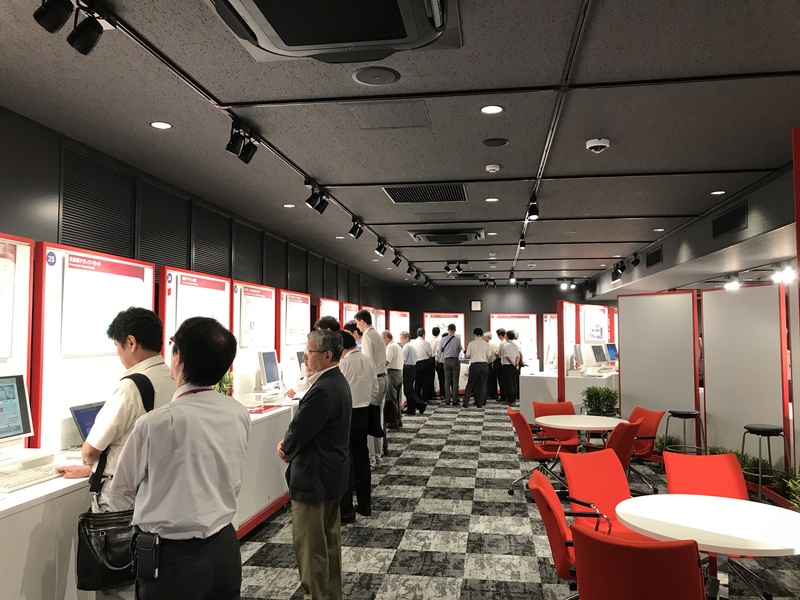 LMAG Tokyo held the Fujitsu Laboratories Tour and Lecture Meeting on July 13th, 2017, with 37 participants. The lecturer was Dr. Nobuhiro Yugami, Senior Director, AI Laboratory, Fujitsu Laboratories Ltd..
“Research and Development of human-centric AI in Fujitsu AI Laboratory”. 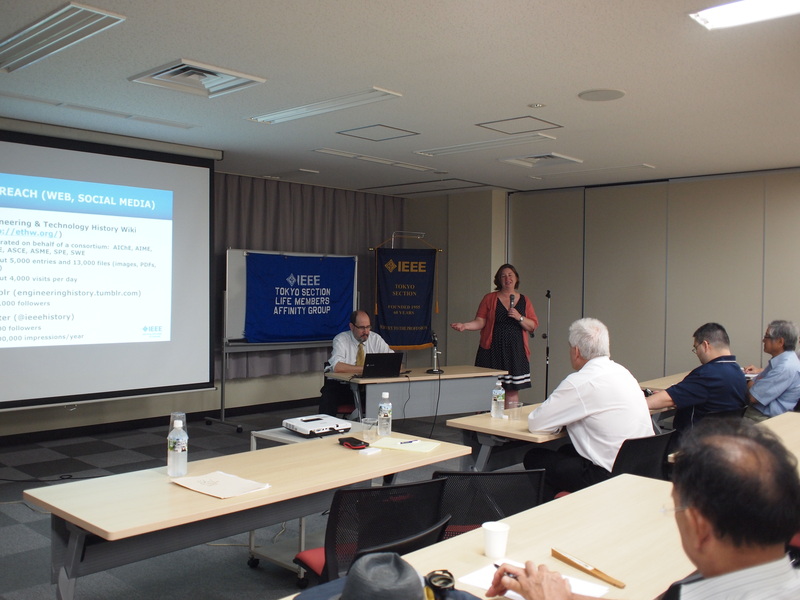 After the lecture meeting, technical tour was held in the exhibition room. 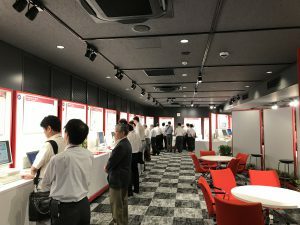 In the end of the events, the get-together was held including members of Fujitsu Laboratories, in the lounge on the 20th floor of the main building. 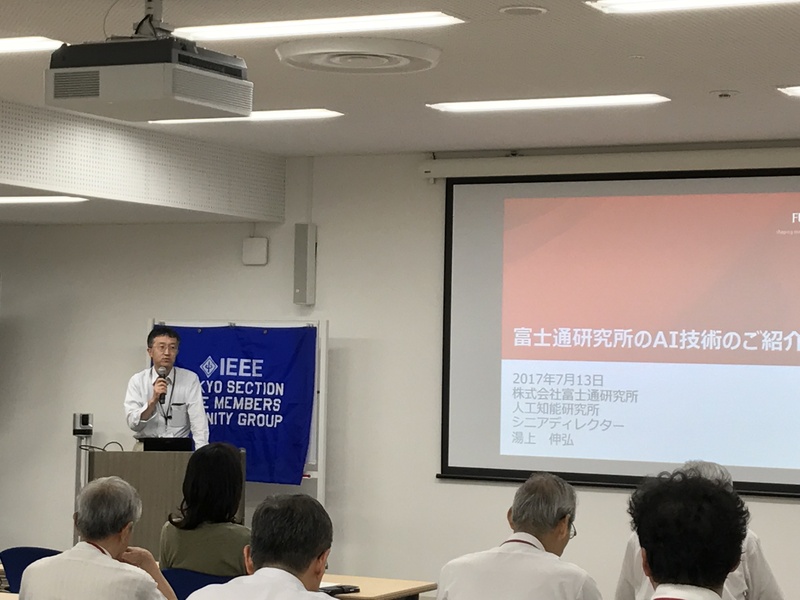 The 2017 Sixth Lecture of IEEE Tokyo Section, History Committee was held on August 9th, 2017, at Kikai Shinko Kaikan with 23 participants. The lecturers were Dr. Michael Geselowitz, Senior Director, IEEE History Center and Dr. Allison Marsh, Chair, 2017 IEEE History Committee. 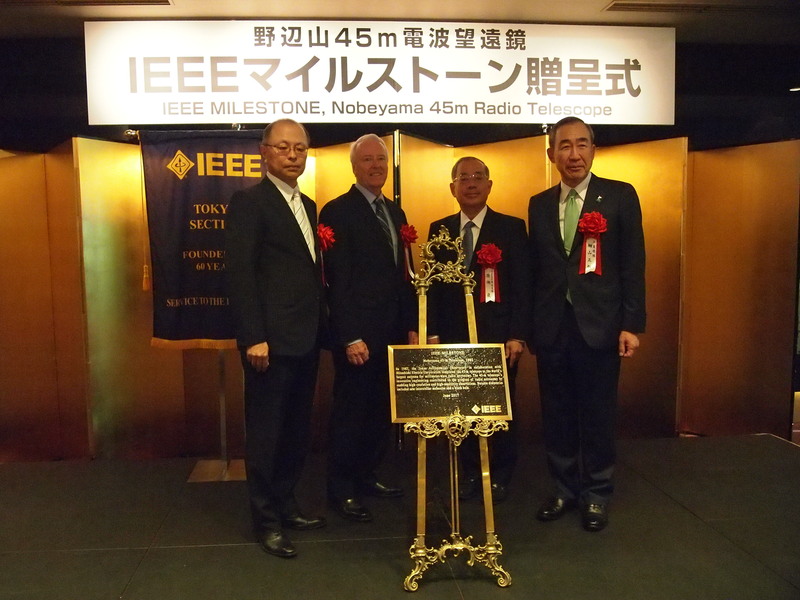 IEEE Milestones, Women’s Role in Electrical History, and Some Topics”. 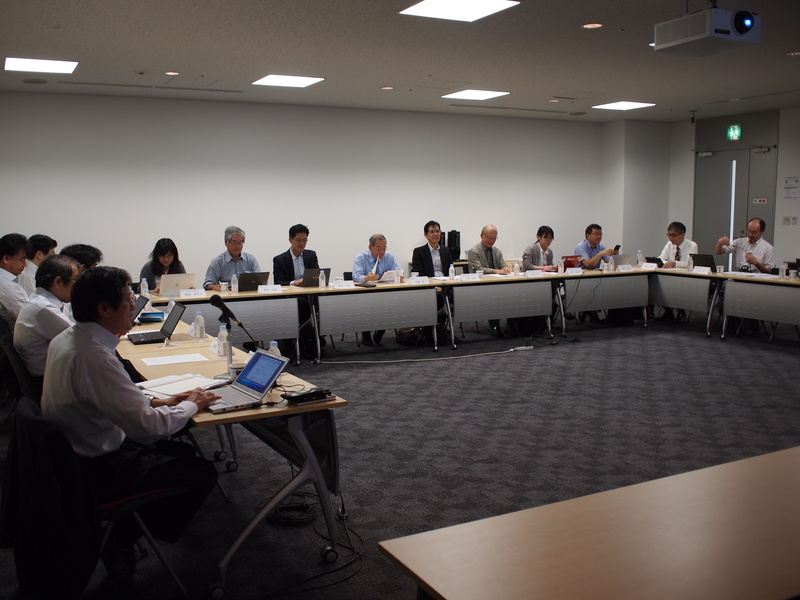 The 2017 Third Meeting of Tokyo Section Executive Committee was held on Friday, September 29, from 3:00 p.m. at UDX Conference, Akihabara, Tokyo.